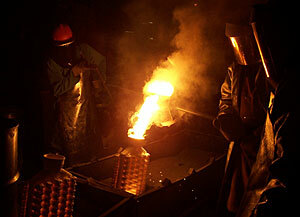 Chicago Vacuum Casting is a leader in the manufacturing of brass investment castings up to 25 pounds. We cast most grades of brass investment castings including Yellow and Red Brass, Silicon Brass and Bronze, Tin Bronze, and Aluminum Bronze. Other grades are available upon request. Contact us with your specific requirements such as corrosion resistance, machinability, or strength, and our engineering staff will assist you in selecting the specific brass investment casting grade that meets your needs. We economically produce high volume, as well as short run orders by the use of manual or automatic molding tools. We have available capacity to meet your needs, and welcome the opportunity to quote any brass investment casting requirements that you may have. Chicago Vacuum Casting also has the capabilities of providing additional services such as machining, polishing, and plating.